In the 1630s, certain Dutch tulip bulbs commanded higher prices than houses. At the peak of tulip mania, many were certain that this would be the investment that replaced boring old gold. They featured a limited supply and every sector of society was caught up in the frenzy. By 1637 the tulip bulb market had crashed 99%. Gold was not replaced as the primary and most reliable store of investment value. For all that has changed in the past 500 or so years, and on the heels of huge 2018 trading volumes, gold is proving, yet again, to be a beacon of consistency and reliability in turbulent times. 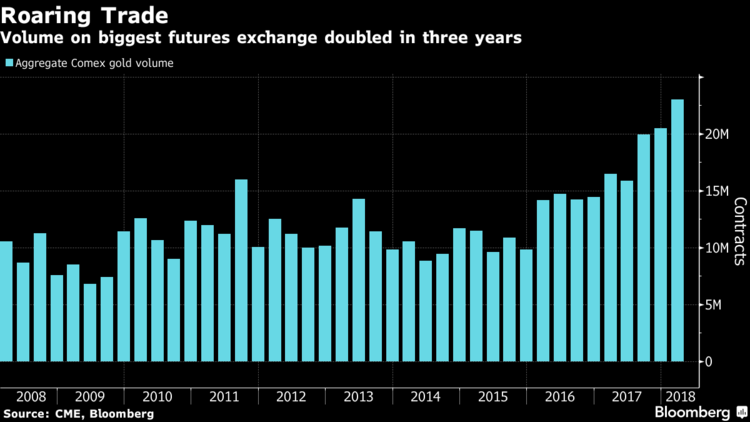 Gold’s haven qualities have come back in focus this year as President Donald Trump’s administration picks a series of trade fights with friends and foes, and investors fret about equity market wobbles that started on Wall Street and echoed around the world. At the same time, although geopolitical tensions with North Korea may be easing, Trump’s pick of John Bolton as his new national security adviser has spurred speculation of a potentially harder line against Iran.